Sales numbers for the month of September are in and for 2013, the results are a mixed bag. Nissan's premium brand, Infiniti, marked an uptick in passenger car sales, jumping 28.3 percent over August, but saw an overall decrease in sales of about 4.3 percent year-on-year. This was the first full month of Infiniti Q50 deliveries, which helped ease the dropoff. Nissan itself, meanwhile, also saw an overall decline in sales by about 5.5 percent year-on-year while the entire Nissan Division (which includes Infiniti and other brands) saw an overall drop of 5.6 percent compared to last year. Several models in the Nissan lineup, however, saw marked increases in sales for September, most notably the Nissan LEAF, which jumped a whopping 99 percent year-on-year thanks largely to the new Atlanta, Georgia market that has been the surprise growth area for the car. The best-selling little Versa, upon which the LEAF is based, also saw an uptick of about 9.5 percent year-on-year and the venerable Pathfinder saw huge jumps in sales, going up 72.8 percent compared to September 2012. The Frontier pickup truck, another best-seller for the comapny, also saw a 7 percent increase in sales. Despite all this good news, overall sales percentages were down. Fred Diaz, divisional vice president, Sales and Marketing, Service and Parts, Nissan USA, explains this as being a simple trick of the calender that happens only every few years: "September was a unique month with fewer selling days than the prior year with the Labor Day weekend falling into August sales reporting for the first time in several years. While this skewed year-to-year comparisons we are optimistic that strong auto sales will continue into the fourth quarter." Nissan notes that had the percentages been calculated by selling days rather than calendar months, September 2013 would have been a 102.6 percent overall increase over last year. Losing those two selling days, however, meant the un-adjusted sales calculations (which is what Nissan normally reports) showed a drop instead of an increase. What a difference two days make! Total unit sales for Nissan were 77,828, with the Rogue crossover totaling the bulk of those at 11,353, followed by the Versa at 8,776 units. The LEAF electric car came in just under two thousand units at 1,953 for the month. At Infiniti, numbers are more sedate, befitting the premium marque. Total sales were 9,040 with most of those being in luxury sedans like the 2013 Infiniti G, which sold 4,144 units, and the new 2014 Q50 at 2,367 sales for September. That new model has sold more than 4,800 units since its introduction last month. 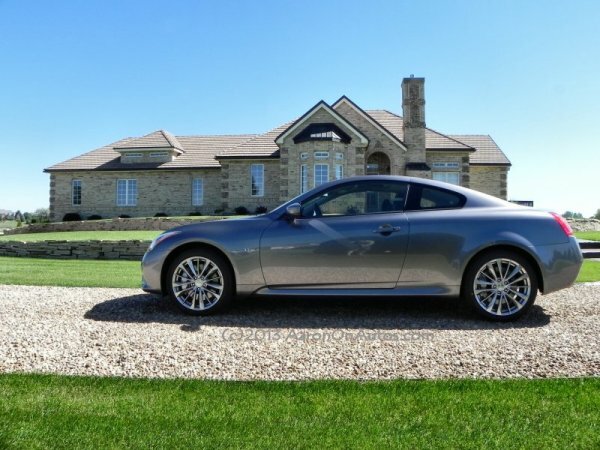 The photo above is of its sister, the Q60 coupe, which also entered dealerships only recently and which I had the privilege of driving for a week as a manufacturer's loan.